There is always something fun to do around here! 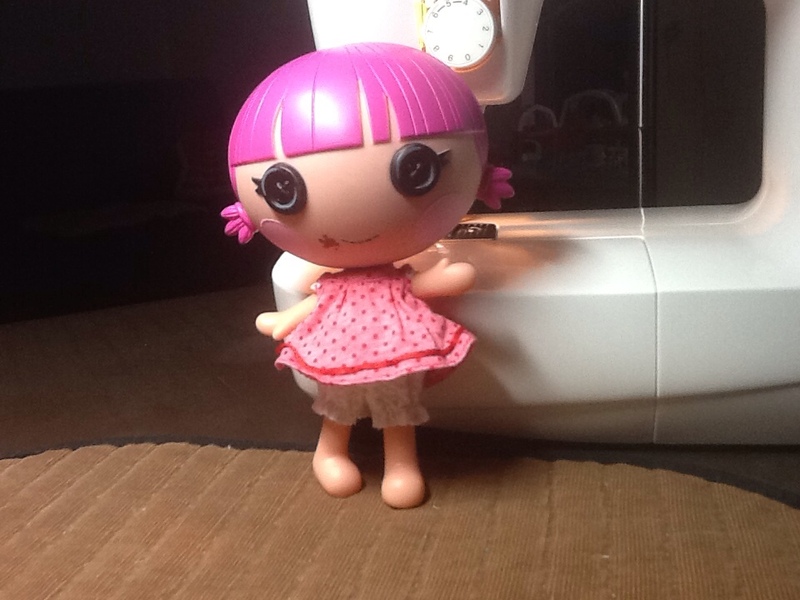 I have three grandkids with Spring birthdays, they all have Lalaloopsy dolls and they all would like me to sew them more doll clothes! So today I focused on designing and creating a new outfit for AJ's Little Sister, Spec Reads a Lot. My model's name is Sprinkle Spice Cookie. She loves cookies and licking batter from the bowl, but her favorite thing is when our grandkids spend the night and she gets to hang out with all of their dollies! 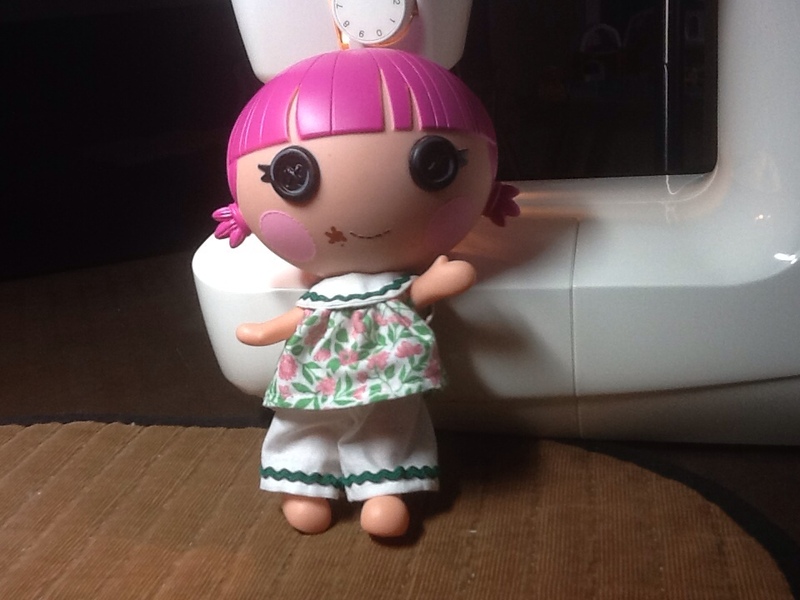 This is a photo of Sprinkle Spice Cookie in the original outfit she came with. Here's Sprinkle modeling a sporty Spring ensemble of white linen trousers trimmed in tiny green rickrack, matching white linen bodice also trimmed in same rickrack with flowing gathered floral of pink and green. 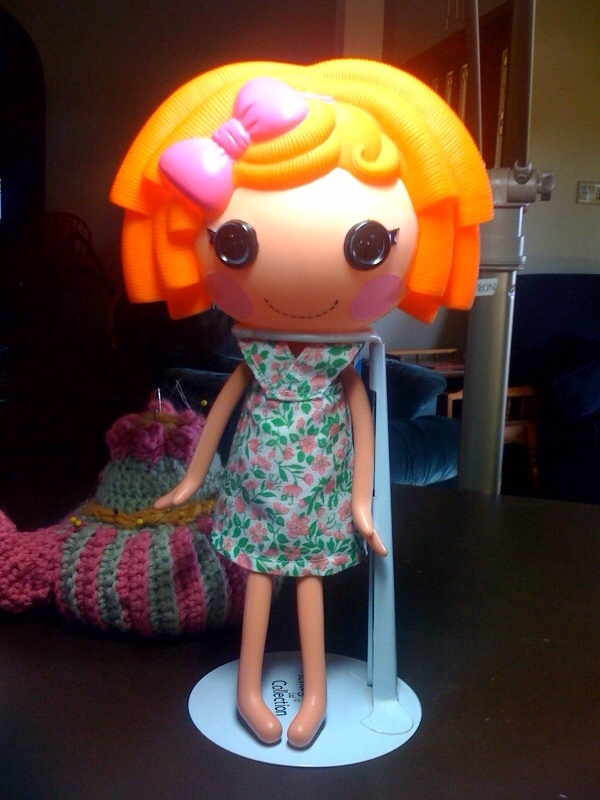 Designing little doll clothes are tougher than it looks, but things like this really get my creative juices flowing! The little sisters are so petite it made using the sewing machine at times impossible so I hand-sewed parts of the clothing. Sunny Side Up modeling a fetching sundress in pink and green floral. Did you notice the beautiful pincushion, teapot in the background? That was a gift from my big sister, Jann Marie! Are you working on any projects right now? Have you ever made gifts for your family or friends before? I'd love to hear about it . . . Over at Julie's! Please send me your comments!